Enlistment bill will help the Torah world flourish, MK Shaked declares. She tells hareidi MKs: I expect an apology. Hareidi army enlistment will be good for hareidi society and for the yeshiva system, MK Ayelet Shaked (Jewish Home) declared Tuesday. Those who oppose the bill either do not understand it, or are actively holding the hareidi community back, she accused. 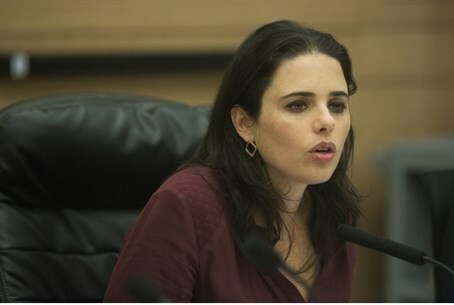 Shaked addressed the Knesset as debate began over a bill on hareidi army recruitment that was created by the Equal Burden of Service Committee, under her leadership. The bill is up for debate this week as part of a marathon voting session on multiple controversial bills. She began by praising the hareidi community for its role in rebuilding the yeshiva system, and Torah scholarship, following the Holocaust. However, she said, today’s reality is different from that of the post-Holocaust years. The Enlistment Bill will help the hareidi community, she argued. “Alongside the Torah scholars, we will see hareidi men supporting themselves and their families with dignity, and contributing to Israeli society in bearing the burden of Torah study, the burden of national defense, and the burden of employment,” she declared. The bill will allow the “Torah world” – yeshivas and their students – to continue at full strength, while putting those who are better suited for employment on a productive path, she said. “Whoever says otherwise either is unfamiliar with the details of the law, or is trying to paint a false picture because they don't really want to protect the Torah world and move the hareidi community forward,” she charged. “In what Torah world, in the name of what Jewish value did you slander me personally like that? You have some chutzpah. I demand that you apologize,” she announced. Nearly all of the MKs in the Shas party served in the army, she noted. “Why doesn’t most of the young generation serve as well?” she asked. Ultimately, the Enlistment Bill’s success is in the hands of hareidi leaders, she said. “It all depends on you,” she declared. “Enough with the incitement… I trust that hareidi society will have the wisdom to understand that this bill’s success is in its interest, and will cooperate in implementing it, for its own good and for the good of Israeli society as a whole,” she concluded.